At California Electronics Recycler we offer fax machines recycling. Fax machines are used for the purpose of sending documents through a phone line. Before the internet, fax machines were the quickest ways to send and receive documents and other besides sending them through the mail. The only problem about the fax machines is you need a dedicated phone line to keep them in service. 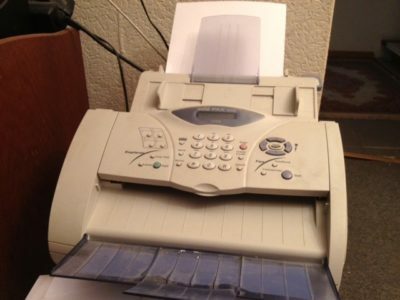 Many companies still use fax machines but are beginning to be depleted due to computers and the internet. It is now easier and quicker to send documents and information digitally rather than wasting paper and ink with faxes. Every year in the United States approximately over 9 million tons of electronics are thrown away. Around 12.5% of these electronics actually get recycled and the rest end up in landfills. Many of these electronics that end up in the landfills can be extremely hazardous and dangerous for the environment. When you recycle fax machines you are helping the environment by not allowing the toxic materials such as cadmium and mercury and lead to land in our landfills and seep into our soil and water supply. Rather than setting these devices on the curb you may schedule a pickup or come drop them off at our recycling center in Santa Ana, California. We have the tools and resources to recycle fax machines and either re-purpose them or break them down to be use in new products. Fax machines are typically large and heavy taking up much a lot of space. These machines can be difficult to move but you can call California Electronics Recycler to schedule a pickup of your fax machines and copiers and other unused electronics. How are Fax Machines Recycled? Fax machines can be recycled in a few different ways. The first way we try to recycle fax machines is through re-purpose. These machines are tested to make sure they function properly and without complications. Then they are put on our re-purpose listings or donated to someone who needs it. If the fax machine is broken and can’t be fixed we send it to our down-stream vendors who are R2 Certified. They are then broken down into scraps through large shredding machines and sorted into separate materials where they can be melted and reused in new products. This reduces the production costs and the needs of mining these precious metals and materials.